The ultimate irrefutable, document-secure Audit Trail! What are Timestamps or Proofs of Existence? A timestamp proves that a document existed in a certain form at a certain point in time. Timestamps are often referred to as “proofs of existence”. Supports all types of files, such as contracts, photos, video or audio files. Indisputable proof that a document’s content has not changed since it was timestamped. The documents/files never leave your device, network and control. The proofs remain stored, for free, indefinitely (or as long as the underlying blockchain exists). How does RockProof document enshrining and validation work? 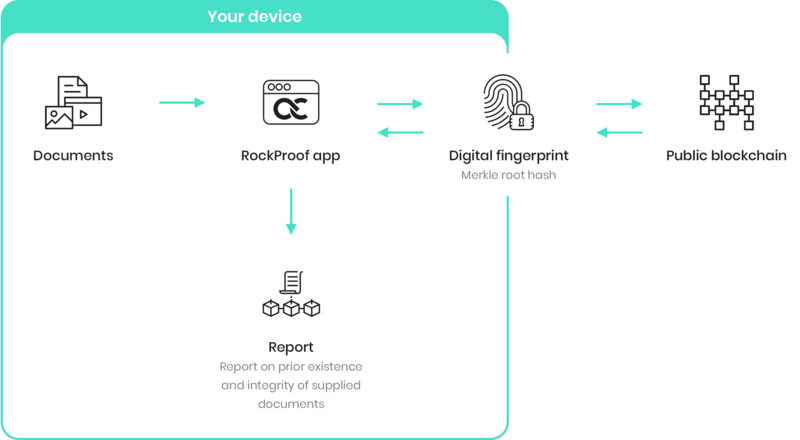 The RockProof local app takes your documents and creates a digital fingerprint of each file individually using a so called Hash function, combines them into a structure called the Merkle Tree, calculates a final hash called Merkle Tree Root and finally writes this final proof into the public Ethereum blockchain, where it remains immutably for as long as Ethereum will exist. How do I use an online services without exposing my personal information to the application / service provider whom I may not (choose / need to) trust ? Is the document I’m reading identical to the one that was issued when I invested? Prove that your documents existed and have not been modified. What bets were made during the applicable insured period? Was this offer truly submitted at the time claimed and can I be sure that its content wasn’t manipulated? Was this document truly signed at the indicated date? Has this file changed since it has been issued/sent/received? Has the audit trail of service checks been manipulated? Has my dash-cam video footage been tampered with since being recorded? What state was the building in when I became its owner? E.g. Capturing photos of state of the property for later claims, dealing with deposits etc. How do I know funds were used for their intended purpose? E.g. Track evidence of use of funds when they were incurred or paid. Can I prove, that I had collected KYC / AML documentation before dealing with a customer and that this documentation hasn’t changed? Can I prove that I was in possession of that music / image / video file before it was published elsewhere? Do you work in an industry prone to litigation? Do you need to have certain facts, events, assets or activities documented and proven to exist at a particular time? Document all your assets (art, wine, cars, jewelry, real estate etc.) and update the list periodically to maintain a tamper-proof audit of integrity..